While race relations in the United States seem to be tenser than ever, Japan is coming to a crossroads with accepting mixed race Japanese and immigrants into their mostly homogenous society. Japan is a welcoming country to foreigners, especially if you are a temporary visitor. The subtle prejudices only become visible to a foreigner once you have lived here for a while and experienced the day to day difficulties you face as an outsider when you actually try to become part of the society. Any foreigner in Japan who has been turned away from renting an apartment simply because they’re not Japanese, knows that experience. 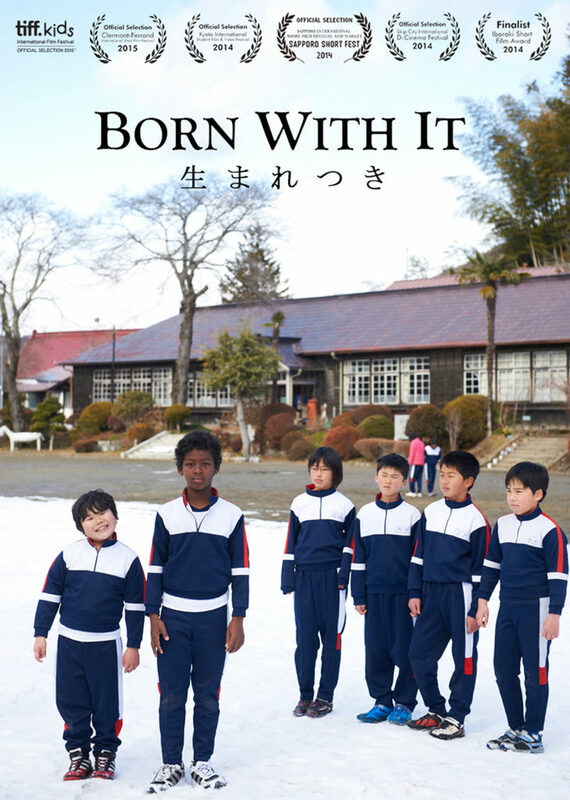 An American filmmaker, Emmanuel Osei-Kuffour, from Texas, depicts this struggle to be accepted as a dark skinned black man in Japan in his award winning short film Born With It(生まれつき). Osei-Kuffour lived in Japan for six years, encountering numerous instances of prejudice and discrimination. 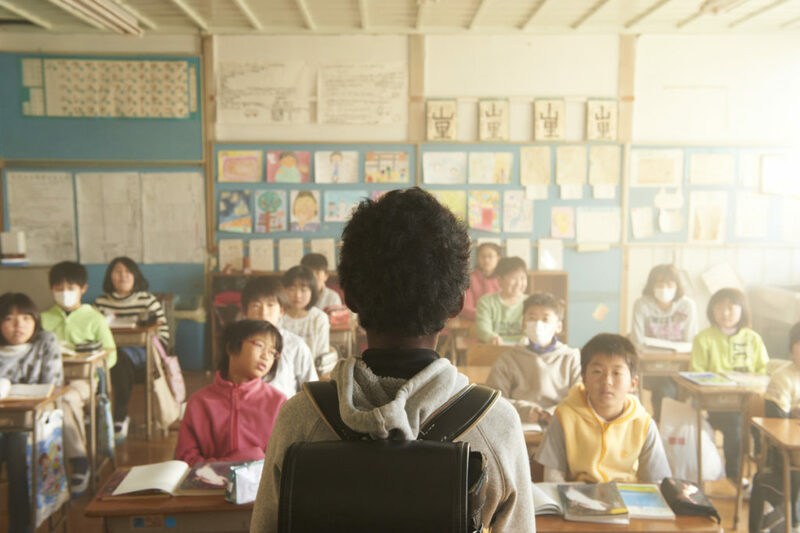 The film follows a black elementary school child in Japan experiencing the cruelty of racism and harsh words spoken unfiltered in the world of children, who have not learned the impact of what they are doing or saying, or how to accept difference. Osei-Kuffour notes “I wanted to tell the story from a kid’s point-of-view because I think its powerful to see someone’s innocence broken for the first time. This is ultimately a story about prejudice and it’s also disarming to see a child unaware of the scars of the adult world. Like most forms of discrimination, the most difficult moments I had in Japan are hard to convey convincingly. Most of the issues I encountered seemed to revolve around me, as a foreigner, not being perceived as an equal, normal human being. There always seemed to be the sense that since I was not Japanese, I would be unable to comprehend Japanese ideas or values, represent my given company in a meeting or share a space with other Japanese people. The seventeen minute film has resonated with many people in and outside of Japan, and garnered praise including The Best Film & Social Impact Award at the NBC-Universal Short Film Festival and Honorable Mention for Best Short Film at Toronto International Film Festival (Kids Section) and many more festivals. “Born With It” will be airing on PBS KQED as part of the show “FILM SCHOOL SHORTS” in San Francisco 10/13 11pm. One would imagine those were the thoughts going through the minds of Fuji Television executives after getting caught ‘mishandling’ the subtitles in interviews done with Korean citizens that made it appear as if the individuals hated Japan. 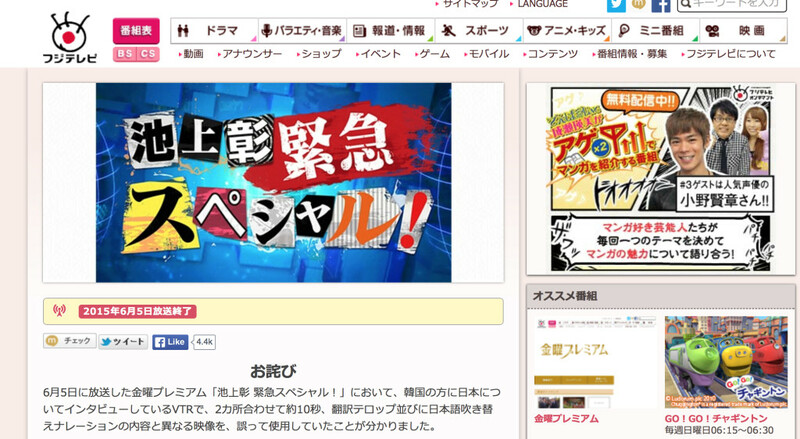 On a June 5th broadcast, Fuji Television subtitled a Korean woman as saying, “I hate Japan. Didn’t they make Korea suffer?” On screen she is actually speaking about Korea and says, “There is much culture here. This seems why many foreigners visit.” Fuji apologised for this and other ‘misedits’ on June 29th. On June 29th, Fuji Television officially apologised for their June 5th broadcast of 「池上影 緊急スペシャル!」(Akira Ikegami Emergency Special). Akira Ikegami is a well respected journalist who worked for NHK from 1973 to 2005, during that period when it was a public broadcaster and not a corrupt mouthpiece for the Abe administration. He served as the host of the network’s news program for children. He now works freelance. In his Emergency Special, ordinary Korean citizens were interviewed as to their views on Japan. The subtitles shown on television were radically different from what the people were actually saying on screen. 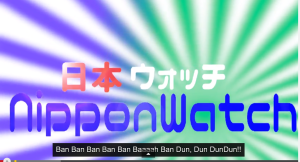 He actually says onscreen, “Japan doesn’t reflect solemnly on past history. That part of Japan, well…..”. According to Fuji Television, in unaired other parts of the interviews, the people said exactly what was shown in the subtitles. Fuji Television didn’t apologise for the content of the program itself but did apologise for the editing mistakes. Click here for the full apology, brimming over with sincerity. Fuji-Sankei group is one of Japan’s most conservative and right wing television/newspaper consortiums. On February 11, a well-known author and former education advisor to Japan’s prime minister published a column in their Sankei Shimbun praising the racial segregation in South Africa—apartheid—as a model for Japanese immigration policy. The hits keep on coming. 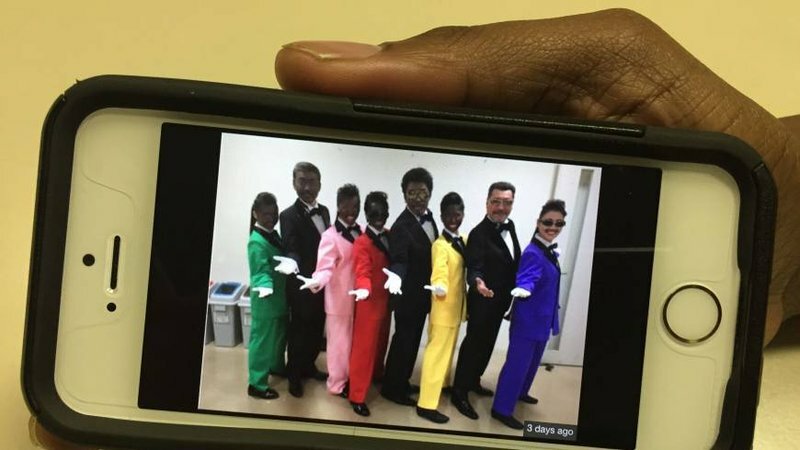 Should Fuji-Sankei Group be red-faced over scheduled blackface music program in Japan? Updated: This article was originally posted on February 28th, 2015. In the end, Fuji Television backed down and there was no minstrel show. The announcement was made on February 11th along with a photo of the two groups taken behind the scenes. That photo, of the two groups posing together in blackface, white gloves and costumes, gained attention when tweeted by several journalists, going viral. While some supporters of these Japanese musicians have labeled this scheduled show innocuous or done in honor of black musicians, the internet for the most part, does not share this sentiment. Japanese musicians in blackface: a tribute or an insult? In Japan, it’s not clear—to the Japanese people and the network planning to broadcast a musical number with the cast members in this make-up. Fuji-Sankei Group is like the News Corp. of Japan. Recently their flagship newspaper published an opinion column advocating apartheid for Japan, suggesting that blacks were bad for property, and recommending that caucasians, blacks, and asians live separately. The columnist was an education advisor to Japan’s current leader, Shinzo Abe. It’s been called everything bad, ranging from poor judgment and a questionable style choice, to flagrantly racist and a mockery of black history and culture. A petition has since been started to urge Fuji-TV not to air the program, scheduled to be broadcast on March 7th at 6pm on the program Music Fair. Though in the days since this controversy began, Momoiro Clover Z has canceled a film screening and press conference with the Foreign Correspondents’ Club of Japan (FCCJ) scheduled for February 23rd — reportedly for fear of being questioned about this situation. Fuji-TV has yet to release a statement or respond to the petition, which has thus far garnered over 2000 signatures and comments from Japanese and non-Japanese alike. It is important to place apartheid in its correct context in order to avoid any country… glorifying it as a policy consideration. Surely the respected columnist and writer is not suggesting such treacherous and archaic laws for nursing care immigration to Japan? Why would Japan, a respected member of the United Nations, and a bidder for the United Nations Security Council non-permanent seat for 2016 even consider such laws? Obviously, the Sankei Shimbun column is clearly deplorable. It is worth mentioning because Sankei Shimbun is part of the Fuji-Sankei group. For more on the Fuji Television story, please watch the following video by the blogger known as Hiko Saemon. His explanation is below the video. *Editor’s note: It may be worth mentioning that Mr. Nobutaka Shikanai, the supposed founder of Fuji Sankei group, in his own memoirs gleefully discusses his role in procuring women to sexually service Japanese soldiers during WWII. Many of these women who were treated in ways that would classify them as human trafficking victims in modern times, were called “comfort women.” The editorials and articles in Sankei Shimbun (Newspaper) have implied that the comfort women did not exist or if they did, they were all happy hookers. The Sankei Shimbun has yet to address the implications of the testimony of their own founder. Jake Adelstein also contributed to this story. Posted on February 28, 2015 March 8, 2015 Author subcultureistCategories Coming Events, Contemporary Culture, Dark Side of the Sun, Featured, Racism, Underground EconomyTags baye, blackface, Fuji, minstrel, racism, Sankei4 Comments on Should Fuji-Sankei Group be red-faced over scheduled blackface music program in Japan? Japan’s Female Police Commissioner worked with racist & sexist newspaper? NOTE: This article has been corrected after a reader pointed out that the Eriko Yamatani corner was written by a Zaitokukai former executive and associate Shigeo Masuki and not Ms. Yamatani herself. Recently appointed head of Japan’s Public Safety Commission, Eriko Yamatani 山谷えり子, who oversees all of Japan’s police forces, may be inappropriate to deal with Japan’s domestic violence issues—among other things. She has been in the news recently for her alleged ties to the Zaitokukai, a hate speech group that the UN, the United States, and even Japan’s National Police Agency have condemned. Prime Minister Abe has had his photo taken with one of the members as well, but that’s probably just a coincidence. Ahem. Eriko Yamatani, the head of Japan’s Public Safety Commission, posing with a member of the hate group, Zaitokukai. She contributed an essay to his newsletter in which her associate derides Japan’s democratic constitutions and suggests women should not be allowed to divorce. Not only is this newsletter one more link to Yamatani and the racist she says that she doesn’t know, it makes us think she isn’t a person who will really want to ensure the police crack down on domestic violence or stalkers—if she really agrees with this guy. Who she doesn’t remember. 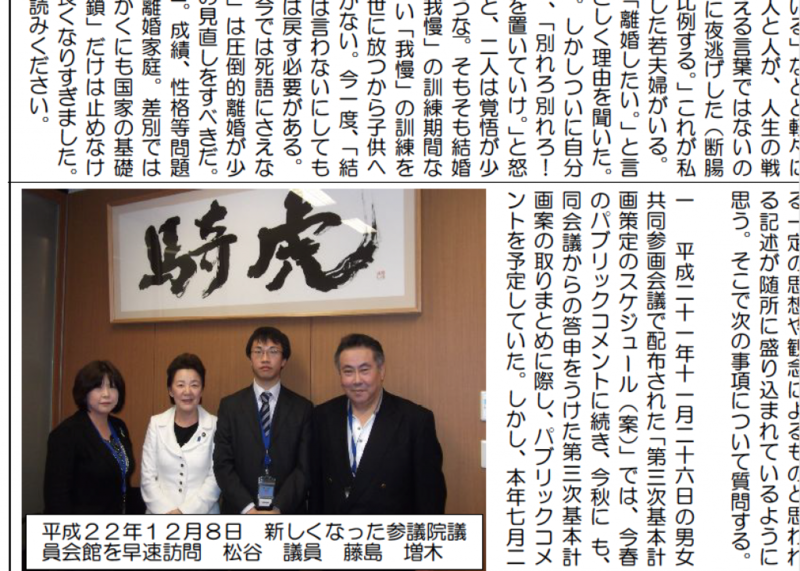 You can download the full PDF of the newsletter here, which also has a nice picture of her with the Zaitokukai right wing racist she claims not to know. *We were unable to get a comment from Ms. Yamatani on the contents of this essay at present. 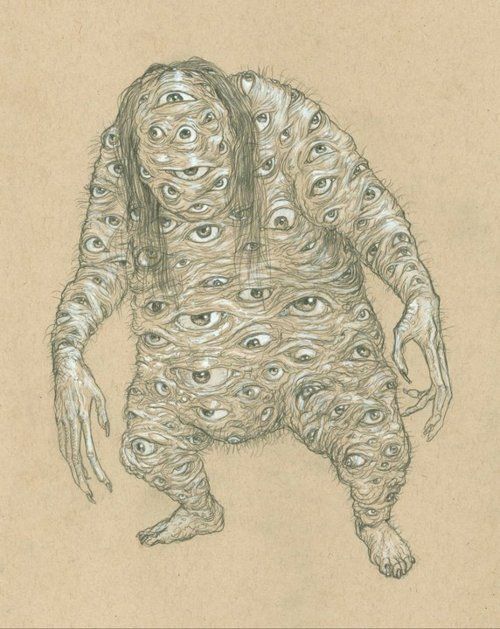 Posted on September 27, 2014 September 27, 2014 Author subcultureistCategories Contemporary Culture, Dark Side of the Sun, Featured, On the Record, Politics, Uncategorized, Underground EconomyTags abe, divorce, Public Safety Commission, racism, sexism, Yamatani, zaitokukai1 Comment on Japan’s Female Police Commissioner worked with racist & sexist newspaper?